Houses Gardens People: Bummer: Restoration Hardware's Fresh spray discontinued. 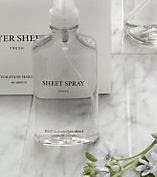 Bummer: Restoration Hardware's Fresh spray discontinued. This is the best smelling room spray I have ever found. It's called "Fresh" and is (or was) a part of Restoration Hardware's Fresh Cleaning Collection. The bottle I have says "room spray" but the online photos all claim "sheet spray". Anyway, the clerk at the Knox Henderson store swore they weren't discontinuing it, but they have. If I'd known, I'd have bought those last two bottles on the shelf. Since then, I've called every store in Texas and Oklahoma, and zip. Finally, I got an email from RH's customer service, after a week, who claims not to know that it ever existed. So, I've switched back to L'Occitane's Green Tea room spray. As you can see, it's still half full, and I've been using this particular bottle for more than 3 years. It's got a clean, masculine scent with hints of pepper. I bought two more bottles of it here and stashed them away. At the rate of 1/2 bottle every 3 years, I should have enough to last the next 15 years.